(Photos by Darren Andrew Weimert) Brooke Fisher hands out a cafe sticker. Anya Lazarow (foreground) with shift supervisor Susan Jermusyk. A beautiful light shines in the Good Day Café, and it doesn’t just come from the sun streaking through the big windows. The light also shines with every employee with a disability who comes to work with a sense of purpose, building confidence in themselves. The light shines in through the door with every customer who leaves a feeling little brighter after enjoying locally ground coffee, a sandwich or a scone, knowing that they made a difference by uplifting their community and in turn uplifting themselves. It comes in with the managers and baristas who could work at any restaurant, but instead choose to work at a place that builds people up, teaching work skills to people who may have never had a chance otherwise. And the light shines bright from a whole community that shows support for the idea that every single person has something good to offer. Many just need an opportunity. And the most wonderful opportunity is here now in State College, and it available to everyone who comes for a cup of coffee and a smile at the Good Day Café. Many of the employees at the café have never worked before, or have worked in a limited role. 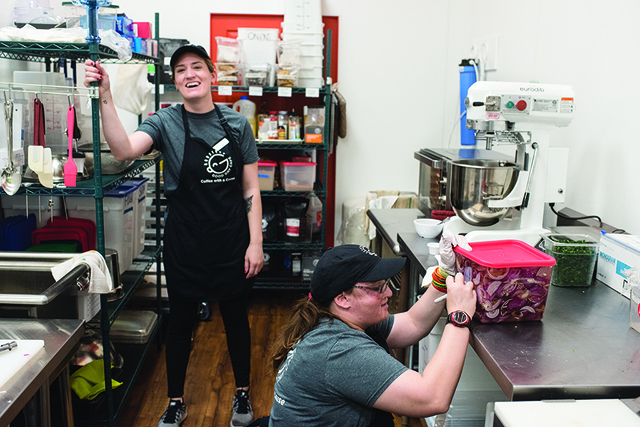 At the café, they are part of a team, interacting with the public and building confidence, says McDermid, all of which leads to a greater sense of purpose that is echoed when you hear the employees speak about their jobs. “I feel like I have a purpose here, because I have job. I love working with my co-workers. The relationship with my boss, and my co-workers really means a lot to me,” says Anya Lazarow. She never had a job before starting at the café when it opened in August. When Strawberry Fields board member Roy Love first stepped into Bitty and Beau’s Coffee Shop in Wilmington, Delaware, he was amazed. He stopped into the coffee shop when he was visiting his daughter at school, and he knew that State College would support something like this. He brought the idea to Cindy Pasquinelli, the CEO of Strawberry Fields, and the pair worked together to make it happen. After all, this was just the type of thing that Strawberry Fields had wanted to do for its clients for a long time. “We knew that this community would support this; I don’t think there was any doubt in my mind. It is just amazing what has happened here,” Pasquinelli says. What happened was an outpouring of community support, starting when Centre Foundation awarded a $100,000 grant that turned the café idea into a reality. But it didn’t stop there. The warm and comfortable space was designed and decorated at no cost by Paula Cipar at Morpheus Studio, and the flooring was provided and installed at no cost by George McMurtry of America’s Carpet Outlet. The Hamilton Square Shopping Center was welcoming and helpful in finding the perfect nook for the café. On the wall there is a “donor tree” with leaves sharing the names of the community members who have been a part of making the café come to life. The doors opened in August, giving jobs to 12 people with disabilities. The shop’s goal is not to make a profit, but instead to provide as many jobs as possible. Every single latte or sandwich that is bought goes toward keeping the place open and people employed. “A job changes your life. Think about what a job means for your life. And when you are dealing with insecurity, confusion about yourself and your role in life and you are 18 years old, that job is the beginning of independence and success,” Pasquinelli says. During the grand opening in August, employee Todd Hoffman had concerns. Hoffman struggles with speaking, but he could tell that the café perhaps didn’t have everything it needed. He wasn’t sure how it was going to go interacting with customers. But assistant manager Allison Ladarola, who has been working in the restaurant industry for 29 years, told Hoffman not to worry, they would “wing it” and it would be OK. The message hit home, and they made it through that first day, and in the months since Hoffman has started to open up to his bosses and other employees. “Wwwiiiinnnggg it,” he still likes to say with a smile on his face as they work through the orders. Hoffman has held a job at another restaurant for many years rolling silverware, but never before has he been able to “wing it” and do and learn so much, all while interacting with others more and more. He is building his confidence, Ladarola says, and is excellent at making sandwiches and the famous chocolate cookies at the café. Hoffman has become much more social since that first day, and a visitor can tell that staff love working with him because he is fun and upbeat. He brings his work home as well, now helping to cook at his group home after his shifts. He is saving his earnings for an upcoming trip. The Good Day Café has opened up his world. “We know a lot about working with people, but we did not know how to run a coffee shop,” McDermid says. Strawberry Fields staffers knew that to be successful, they needed to have a top-notch coffee shop that people would keep coming back to. They hired a pair of managers who had a strong background in the restaurant industry and baristas who knew how to work the very expensive expresso machine. 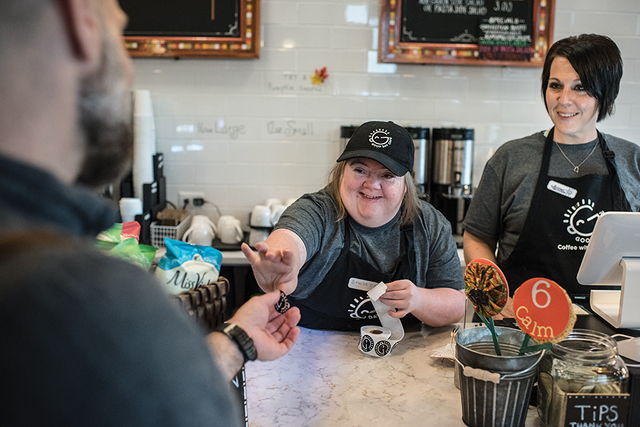 Along with the 12 employees with disabilities, there are six baristas who have restaurant experience to help keep things rolling. Rothrock Coffee has been instrumental in training the staff on how to make top-notch coffee products and is always available to help if something is needed. The folks at Taproot Kitchen help by bringing in some of the food for the café, especially when the café’s kitchen was getting its feet wet. The managers and the baristas work hand-in-hand with the staff to make lattes, sandwiches, breakfast foods, soups, scones, and cookies. The café draws your typical busy customers – people looking for a quick bite and latte before the work day, college students trying to stay focused on school work while avoiding distractions from their social media, and friends looking to catch up over a cup of coffee. But the customers are doing more than that. Sure, it feels feel good spending money to help support the mission of the café, but it’s hard to go there and not have a smile come across your face. It is hard to be impatient when a young person with an intellectual disability is working so hard to make you happy by working the register and brining your coffee. It takes the stress right out of you. It is hard not to smile and warm up when Brooke Fisher – Brookie Cookie as her manager likes to call her – comes up to you with a sticker and asks, “Are you happy today?” She is beaming while she hands you the sticker, and if you weren’t happy before, you are now. Customer after customer beams after talking with Fisher, and the feeling is contagious all over the café. Everyone appears to be relaxed, happy, and thoughtful toward others. If a customer drops a napkin, three people rush over and offer to pick it up. Customers take that feeling with them as they head out the door. Bethany Masteller washes the tables in the café with a sense of purpose, and she doesn’t take a moment off. When she sees something that needs to be cleaned, or a customer waiting to be waited on, she jumps on it. It was not that long ago that she couldn’t find a job after graduating from high school; now, she jokes with her manager that she might start looking for a job at another coffee shop in town, because she is so good at it. But seriously, she says she would never leave the Good Day Café, because it has given her so much. The Good Day Café is located in the Hamilton Square Shopping Center, 286 West Hamilton Avenue, State College. Find the café on Facebook for more information.